HMCS Cobourg en route to active duty in the Atlantic in 1944. During World War II, Canadian shipyards produced a number of Corvette Class warships to help the Allied cause in the Battle of the Atlantic. They were named after smaller Canadian cities and towns. In July 1943 the corvette HMCS Cobourg was launched in Midland, Ontario. 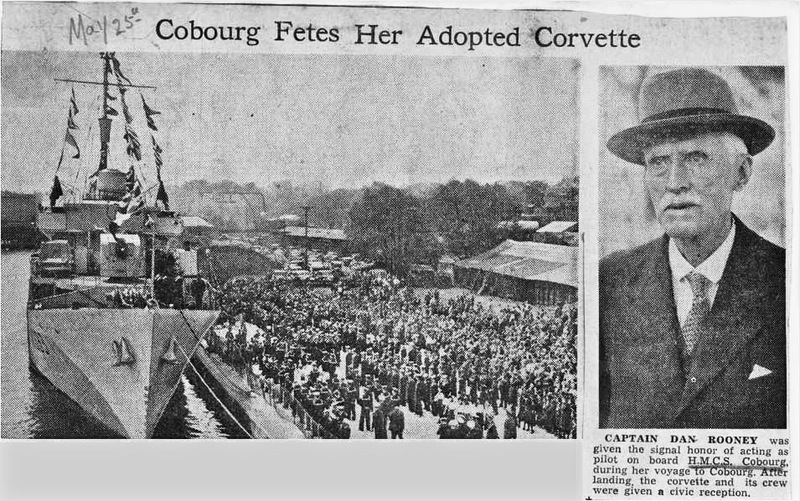 Naturally the Town of Cobourg and its citizens took a personal interest, so when the corvette arrived in town on May 24, 1944, it was a very special day. Captain Dan Rooney (Little Dan), by that time retired, was honoured by the Town, being asked to accompany the ship from Toronto to Cobourg. On May 24, 1944, amidst the flying of flags and cheering throngs of citizens, Rooney proudly piloted HMCS Cobourg into Cobourg harbour – his last command! 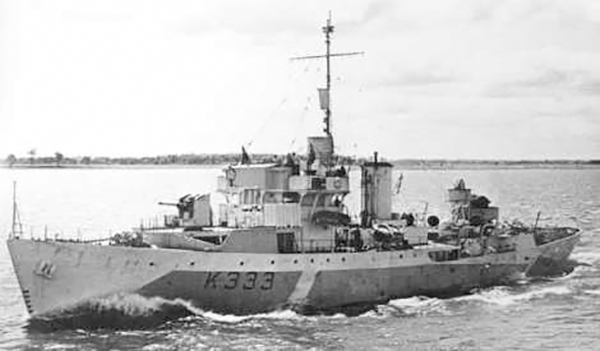 On May 25, 1944, HMCS Cobourg visits its name sake town. With the Cobourg Scottish Kiltie Band playing stirring airs, the Cobourg berthed that morning in the inner harbour. Ceremonies and inspection tours took place throughout the day. The officers and crew were entertained royally. The citizens of the town supplied the ship with all manner of items such as radios, sports equipment, victrolas, books, electric irons, toasters, hot plates, linens, musical instruments, windbreakers . The next day the Cobourg departed with the daunting prospect of joining the Battle of the Atlantic. Following its military service, the vessel was sold to commercial interests and it eventually burned and sank as the Puerto del Sol in 1971 in New Orleans. She was later raised for scrap, and the ship’s bell of HMCS Cobourg now hangs in the Mayor’s office at Cobourg’s Victoria Hall. View this video with a transcript: “Mayor With Bell of HMCS Cobourg”.